After experimenting, the best setting for my iron was #2 for nylon. A too-hot iron will cause the foil to shrivel up like a piece of peeled sunburn. See that chunk on the right in the picture above? Bad. No color will stick to the paper. I found that a lower setting worked better. Make sure the iron's steam is turned off, too. Update: I've discovered foil sticks better to coated paper than uncoated. And even better than an iron, I found a laser printer works pretty well to adhere the foil. See this post! So in the picture where you are peeling away the foil, do those lines just shake off, or was that another finished object that isn't shown? that is a stupid cool project! Oh, that's a different design. I printed a couple variations using the seal design. Good question, by the way. I've updated the post to clarify that. This is legendary! Thanks for sharing! Did you try to iron on a dishtowel placed upon your design? That way you can use a hotter iron without burning/shrinking the foil. I did try it with a sheet of paper over the design and a hotter iron—a dish towel wouldn't be smooth enough, I don't think—but the best results were obtained without any cover over the design. The goal is to get the iron to the right temperature. Hotter isn't necessarily better, I found. I'm very intrigued if I can buy those foils in Germany. I learned that they are used for model making originally. Love that you posted this. I think I saw the same tutorial you did possibly that was on pinterest. I too ordered the foil and have some shiny gold, copper (love it), red, and satin silver to play with. I went the laminator route since i have an abundance of office depot rewards and figured, why not by a laminator? I have only tried one thing since i only had one laser printed scrap sitting around and work has been crazy busy. The print i used was kind of spotty on it's own since i had run some 120 DTC though the laser printer, it didn't like it. The foil adhered good and was only spotty because the print was spotty. I need to lay down some heavy toner and see how it does. Yeah, I was determined to make my investment work. :) Josh, you're gonna have fun! That was quite an experiment! I'm glad you ended up with some lovely results! Memories for me too when I was a graphic design student back in the late 80s and early 90s. The machine used for heating the foils onto the design was called an omnicrom. Blast from the past! Neat-o! I'd love to try this for Christmas cards, if it's not too time-intensive. Two questions: 1, how "stuck on" is the foil after application (does it rub off) and 2, do you think it would work on colored cardstock? PS your blog is my favorite for graphic design. So helpful & fun. At my university in the late 90s, we didn't get to use stuff like this. I missed out! Just the name "omnicrom" pleases me. Also, the fact that there's something called a magnetron in my microwave oven makes me happy. Emily, it's super stuck-on. This stuff won't rub or flake off. It definitely works on colored cardstock. 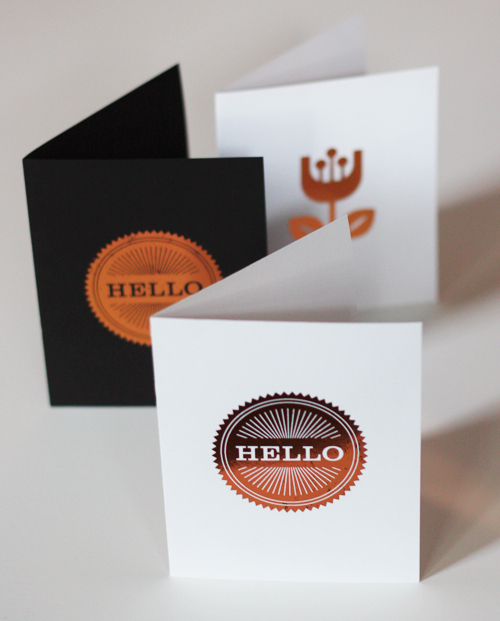 I ran black cardstock through my laser printer to make some black cards. I figured the same amount of toner was on there, even if I couldn't see it very well, and it worked great. 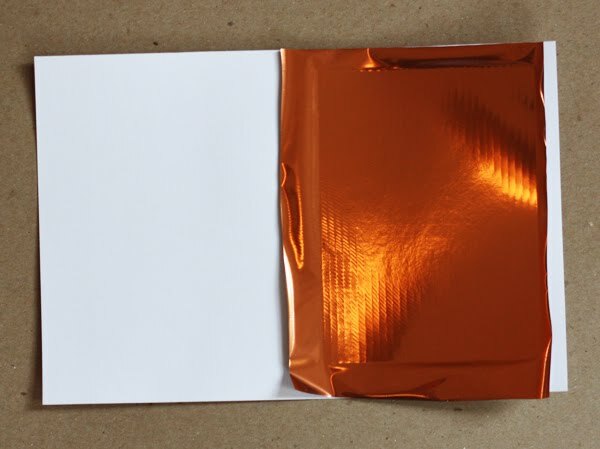 Probably the smoother your cardstock, the better, so that both the toner and the foil will stick well. 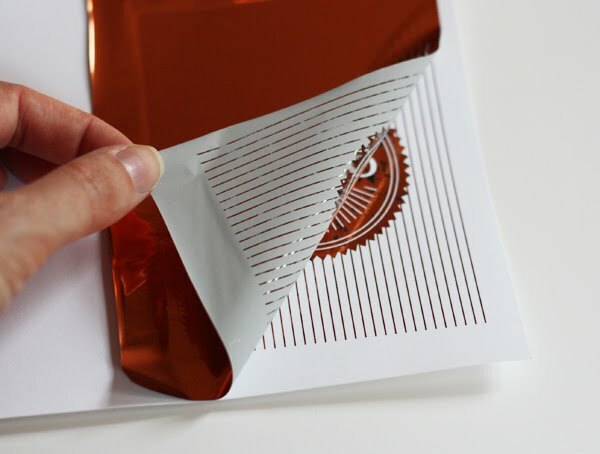 It takes less than a minute to iron the foil on, so you can produce these lightning fast. Plan on some rejects, since not every print will be great, but you should end up with a bunch of keepers. beautiful! the wheels in my head are spinning! Might want to change that to "cardstock" for people like me who only skim the description and are easily confused in the instructions. Nice tutorials! Thank you for inspiring all of us! Hi, this looks great. Would it not work properly with an Inkjet printer? We don't have a laser printer but I'd love to try this. Arrie Bee, I meant that I placed my laser printout on top of my stacked cardboard on the table (corrugated and chipboard). Just changed the post to read "chipboard" to make it more precise. Hope that helps! Kimberley, an inkjet printer won't work since it's a different printing process. Sorry! This looks great! I have to try it! Will this work with regular tin foil or will it only work with the specific type of foil that you bought? Regular tin foil won't work. You need the special coating that's on the back of this foil, which reacts to the plastic in toner when heat and pressure are applied. Wow! thats something new to me. Your tutorial is excellent, I have to try this. This may make some really cool greeting cards for Diwali. I can not wait to try this. Now I'm not going to be able to sleep. So many possibilities! Thank you. What a nostalgic post this is for me -- reminded me of the old Color Tag transfer system. Came with its own little heating element. these look so awesome! i can't wait to try this. 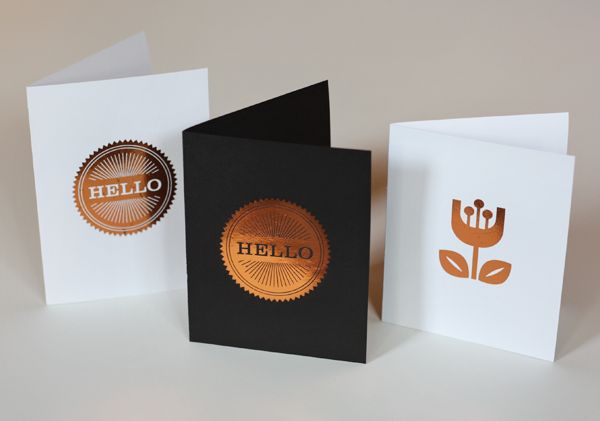 :) the one with the dark cardstock looks amazing! I, too, used Omnicrom color and foil sheets in college for comps, ahem, 20+ years ago, before there were desktop color printers. I still have some sheets stashed away for a rainy day! I can't believe they still make this stuff! And what a cool idea to laser print on black paper before doing the foil! Wow! Brings back memories. I have a kit in the basement somewhere that I used to use to do mockups. Now you've got me interested in pulling it out and playing with it again. It had a heat thing that came with it. The foil was in strips. Anyway, now something else to add to my list. Thanks!! I wanted to come back with some thoughts and results. This is using a laminator and not an iron. I am still experimenting but right now my prints are coming out almost tiger striped. Like my ink coverage is uneven and it isn’t adhering as well. I did make the prints at around 1:00 and didn’t run them with the foil until 6, so maybe it really does need a fresh print. My printer is at work and my laminator is at home right now… I also did a double pass through the laminator, which didn’t change anything. So I will be trying to figure out what my problem is. I was running mine on 80# and 100# french paper cover that I had a sampler pack of. I used a piece of thin chipboard with one of mine, and i also ran one with just the paper and no carrier sheet. They came out the same. So if your paper is thick enough. No carrier needed (hopefully the heat through the backside is not causing my adhesion problems). I also just cut out the foil big enough to cover my image and used painters tap to tape it to the paper flat and ran it. no folding over the edge, less waste, etc. Double pass on the camera . it actually held the halftone nicely, the adhesion problems make the halftone look bad. Also the gold on the green just was a bad choice. i thought it would look good, it was super hard to see. I did it with clothing iron before too but it didn't go so well. I hate seeing those black toner showing up the foil... it's never been so perfect with an iron instead of a laminator. Reading the comment of the person who has had varying results, strangely, the type of laser printer you use might affect it. An artist friend of mine does beautiful work transferring laser-printed artwork to polymer clay. He tried many laser printers and found one that consistently produces the best results. It doesn't seem to matter how long passes in between the printout and the transfer (we've worked together with printouts many months old), it only matters that it's the right laser printer. We love this result, great tutorial, thanks for sharing! Great idea! I wonder if a craft iron or quilter's iron might work too? I'm not sure what a craft or quilter's iron is, or how it differs from a regular sewing iron like I used. I asked the manufacturer about running the foil back through the laser printer like Joe, Christina, etc. said. It sounds like it's pretty tough to pull off. "Due to the static charges in all laser printers, it's VERY difficult to prevent wrinkles. This is why we stretch the foil over the paper when using the iron. Calibrating the iron is really necessary to prevent the "mess of wrinkles" as you're generally getting too hot without enough pressure when you see that. Pressure is KING when using these foils (which is why the Laminator works so well as it applies hundreds of PSI as it passes through)." The manufacturer suggests stretching the foil tightly over the image and taping it down before ironing, which I still need to try. Josh, my guess is that the problem isn't with your toner, but that the foil is wrinkling and somehow needs to be stretched more taut when it goes through the laminator. I had talked to him about the laminator as well. I had purchased the 320 because I wanted to be able to go bigger then letter size. unfortunately you can't modify the 320 in the same way. I took most of it apart 20 min after it was delivered and it just can't be done. i debated exchanging it for the 220, but i still wanted the ability to do bigger sheets. So I am trying to figure that out still. I really hope it works out and you get it down to a science! I'm going to play with my iron some more before I venture into laminator land. But I may join you there. exchanging my laminator for a replacement to see if it helps. It is definetly the laminator though. still tiger striping, and now I have a roller mark. I put similar items through in 2 different orientations, so i can rule out my toner since it was consistent with the direction of it going through the laminator. Hoping a replacement will fix it. I really want this to work. I had BIG plans. I am going to try the iron at some point but for one idea it requires little areas but all over a larger area, which would be horrible to iron it all. might have to go back to a wintergreen oil transfer for now. or i could just output through the laser on nicer paper, but it still looks so cheap. Josh, sorry to hear about your troubles! I'm dying to see what your project is once you've got it perfected! Absolutely great DIY! So gorgeous and chic! "You'll need a hard surface like a table or floor, especially one that you would be very sad to ruin. It adds to the excitement." I've never laughed out loud at a tutorial before. Hoo boy. The original tutorial linked to shows re-heating the toner with a heat gun or a hair dryer. If you're laser printer isn't in your home, you may be able to warm the toner back up again before trying to apply the foil with a hair dryer when you get home before attempting the foil+iron or using the foil+laminator. Just a thought! Hi, how did you transfer to the dark paper? I'm really itching to try this, but I thought it had to be printed with black ink...any help is appreciated! I just put black paper in my printer and printed black on it. You can just barely see the printing enough to position the foil on top and then iron it on. 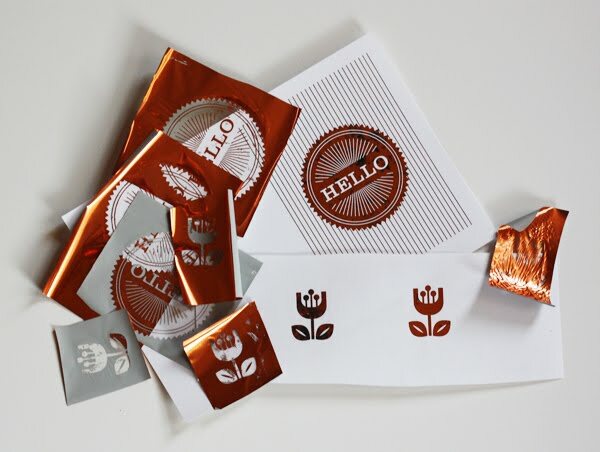 The foil will stick to just the black toner. I'm really excited to try this! ... but I'm also so frustrated that the shipping from that place to Canada costs more than the product itself. Anyone know where to get the foil in Canada? I'm really digging this! I'm doing my wedding invitations myself so this could be something extra to think of! Thanks for the tutorial!! That's weird! Are you sure there's no toner residue on the paper that the foil is sticking to? It should stick to paper by itself, without toner to cling to. Have you tried different paper? Also note I've updated this post with a couple tips at the end. I'm having the same problem. Did you figure out what you were doing wrong? Hi! I randomly found this blog post that I don't believe credits your original post. Do you know about this? I didn't know! Thanks! I'll follow up. Can you comment on the type of paper or brand of paper you have used? Also can you comment on the printer and or print settings used on all your successful runs? Thanks and cool stuff! I don't have the labels from the cardstock I used, but the best ones were dull/matte coated text or cover weight. My printer is a Brother BW laser printer. I didn't use any special print settings; just hit "print" from Adobe Illustrator and out it came. I bought the sample pack you linked to (it might have been in the second post about using the printer a second time instead of the iron). 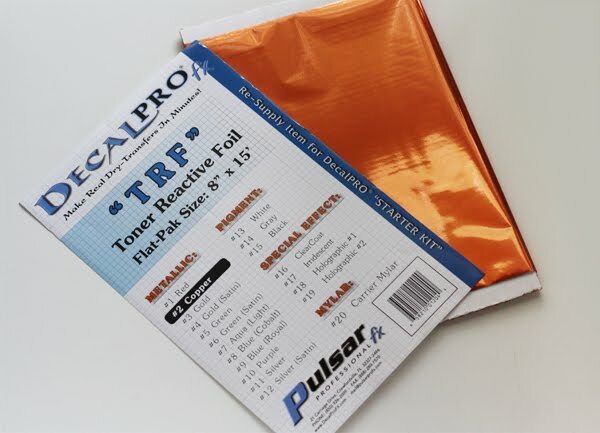 Anyways, have you tried out all of the foils in the sample pack? I'm interested in the silvery one that is supposed to go under your printing. I'm slightly confused how to make that one work and would love any tips you have. I've used the colors and "normal" ones but haven't tried that. I recently bought the supplies to do this. I don't however have a laser printer, so I had them printed on a copier. I know it shouldn't really make a difference but I'm wondering. I wish I knew! I haven't had that problem. My foil is still stuck on for life. All I can think of is it's something with the formulation of the copy machine's toner. Based on comments I've read on my different posts on this project, it does seem like the type of toner matters. Your conversations with your husband crack me up! Blah blah blah. 😂 Thanks for sharing, I'm inspired! I just tried this and had the same issue with missing flecks...then I remembered I own a ski wax iron (cheap to get compared to a lamination machine). It doesn't have holes for steam in the bottom and doesn't get as hot. But, most importantly, they don't ever shift temperatures like a home iron does. It was perfect! So, I guess the key is the make sure you move the iron enough to not let the holes interfere and use a lower temp...very cool tutorial, thanks! Thanks for the post, I'm making my own wedding invites and running the foil just over our names. I am getting the invites at a print store then bringing home to run the foil through the laminator. I am using linen paper which I think may be my problem cause the foil is sticking a bit blotchy. Do your white cards just look black when you look at them straight then when you change the angle you can see the shine? My text just looks black until you turn the card on an angle for the light to catch it, a rather large angle. Also, I was first trialling with silver but would like to use rose gold or copper, did you notice a difference in look (ie more shiny) with the other colours? Appreciate your advice! It's been a couple years since I worked with this stuff, but I would guess that linen paper is not well suited to this project. The toothy texture means the toner and foil will have a hard time getting into all the little recessed nooks and crannies to stick properly. Plus it's probably uncoated paper, which doesn't seem to work as well. 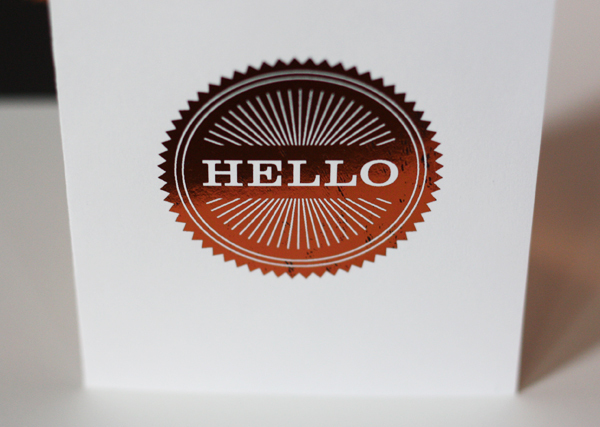 I haven't tried silver foil so can't comment on the look or shine of that color!